I suspect (and hope) Chi’s estimate of 9000 additional fatalities per year in the US due to a $2/gallon drop in the price of fuel is too high, but lowering the price of gas will increase VMT (all else equal), and especially will increase VMT of marginal (less skilled, younger) travelers (those who were priced out of traveling when gas prices were high, and now come back must have less experience than those who have been driving all along). This is fighting against the general trend of peak travel and increased safety. It will take a bit of time for people to adapt to lower prices again, and it depends very much on how long the lower prices last (a month, a year, a decade). But low prices when the economy is expanding is something we have not seen since the 1990s, when annual fatalities were notably lower. 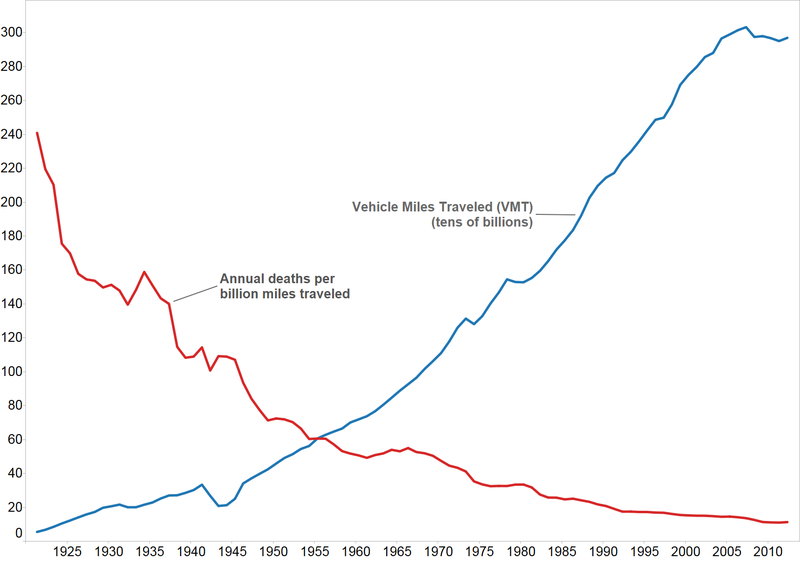 Note the downward trends in vehicle miles traveled and the corresponding drops in the death rates in 1974 and 1980 (oil price shocks). In about 1981, Patrick Bedard wrote an interesting article for Car and Driver magazine discussing the correlation between fuel costs, VMT and the death rate. The low gasoline prices of the 1990s do not look like they corresponded to an increase in death rate even though VMT grew significantly.